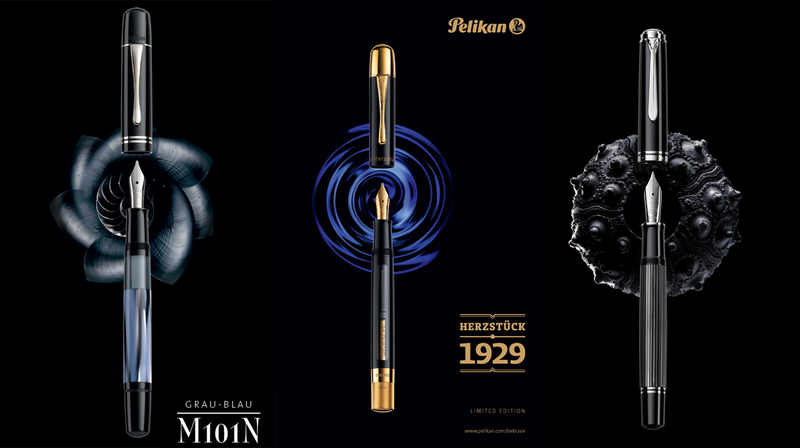 It seems like forever ago that we got our first glimpse of Pelikan’s 2019 line-up. News of the Herzstück 1929 limited edition and Edelstein Star Ruby broke in late December. January came and went with the much anticipated announcement of the M1005 Stresemann. Most recently, February brought news of the M101N Grey-Blue. Despite the regular flow of new releases out of Hannover, we have only seen the Star Ruby ink materialize which went on sale earlier this month. The fountain pens have yet to turn up. A few were pushed back slightly from their originally announced release dates and another has seen a more significant delay for what have been unclear reasons. If you recall, the M1005 was due in mid-February, the M101N Grey-Blue sometime in March, and the 1929 by late March. Rumors have been floated as to the reasons for the hold up of the M1005, some suggesting that there was an issue with the plating on the nibs. I reached out to Pelikan to specifically address these issues and was able to get a little clarity on what we can expect in terms of upcoming release dates. Pelikan also took the opportunity to debunk some of the recent rumors going around about their products. I’m happy to announce that the M101N Grey-Blue and Herzstück 1929 are not far off. They will be launched on March 25th and April 1st respectively. The M1005 Stresemann is another story, as its launch is now target for sometime in June. Jens Meyer, the global marketing manager of fine writing instruments, informs me that Pelikan encountered quality issues with a component that they purchase from an external supplier. In order to ensure a finished product that meets the company’s high standards, those sub-standard components are to be re-produced. While he did not comment on which component(s) was at issue, he did mention that it had nothing to do with the nib. Pelikan recently announced as much themselves on their social media outlets. While I had Jens’ ear, I made one additional inquiry. I have heard from a few sources now that the Toledo line of fountain pens was being discontinued. As they were only rumors, I wanted to verify whether or not such a wonderful and iconic pen was truly coming to an end. I’m happy to report that the official word, for now at least, is that the Toledo will remain a part of the standard line-up. The M700 and M900 continue to be featured in the 2019 catalogue and there are currently no plans to discontinue the product line. So there you have it. Hopefully that brings you a little more clarity about the timing of some of the upcoming product releases and allows you to plan accordingly as well as dispel some of the rumors that have recently been floated. For what it’s worth, I do appreciate that the company won’t accept a sub-standard component and would rather face a significant launch delay than release something less than perfect. What is the definition of launch? Does it mean that Pelikan will start shipping to their distributors who will than start shipping to their retailers or does it mean that the retailers will start sending out their pre-orders to their customers? I think that you have figured out that I’m sitting on a couple of pre-orders. I may have missed it in earlier postings, but is there any reasonable explanation for the historical and ongoing M101N pricing, other than “Pelikan can”…? What sets this series of pens apart from the other other Pelikan offerings to the current (monetary) degree reflected in the price point? I remain interested in the Grey-Blue, while waiting to see how it looks in actual photographs. Then, I review its pricing again, and gasp anew. The price points vary greatly depending upon where you’re looking and the availability of discount codes. The high pricing has been particularly problematic in the US market. What price makes you gasp? You should be able to pick this one up near $400 if you look abroad. Yes, I’ve been looking US, and factoring in the requisite nib grind as well (ie, a grind to cursive italic either at the time of sale or afterwards, with some US vendors include the price of this in the overall cost). I might recommend that you check out the prices at Fritz-Schimpf. Edelstein star ruby ink, as of writing this post, is not on sale nor released at the retailers. Could be soon, but pelikan is not exactly on time after their announcements. Let’s see what the the M80x and M60x lines bring. That depends upon which region you’re shopping from. Agreed that it’s not yet globally available but there are retailers reporting product in stores and available for purchase now. You might want to look into German vendors. I suspect that would be your best bet at present until stock becomes more widely available. Any word on the special edition M20x yet? No official word yet though I’m pretty sure it’s just a matter of time. Past announcements have come anywhere from June till August so look towards the summer. Speaking of rumors. Have you heard anything about Edelstein Garnet being added into the regular lineup? If so any idea when? I reported on this back in October 2018. It’s been in the regular line-up shortly thereafter and the usual retailers have supply. The Goulet Pen Company and Anderson Pens are both carrying it for $28. You can read my announcement here.